I was walking down St Martin's Lane the other day when a cyclist going the wrong way almost ran into me. As he swerved past I shouted “Get Off And Milk It !” a very common and I think witty phrase to be hurled at all cyclists when I was young. The cyclist turned his head and instead of looking angry he had a half-bemused/half quizzical look on his face which was not what I was expecting at all. I suppose this is what happens when you use forty year-old insults. 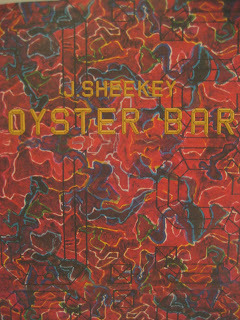 I was on my way to J Sheekey Oyster Bar, a small annexe to the main restaurant in St Martin's Court. The style is very similar to the bar next door: wood panels with photos of various thesps, a low ceiling giving a cosy, somewhat cramped feel and in the centre a big horseshoe-shaped bar. There's some waiters taking orders and serving drinks and a couple of chefs shucking the oysters and preparing the shellfish. 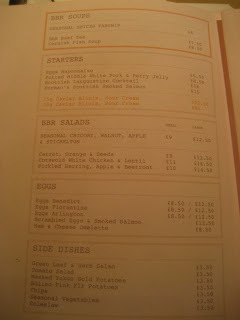 The menu is very familiar too offering a good range of raw and cooked stuff. 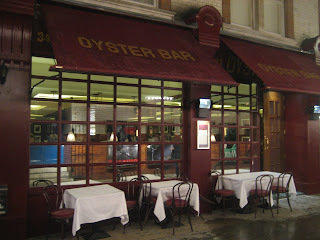 Of course I was just there for the Oysters. 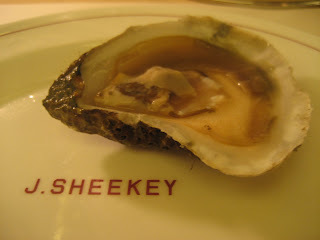 I love Oysters and have been eating them for years and years but like good wine and turning left on an aeroplane once you've tasted English Natives it's hard to go back to any other variety. A dozen West Mersea natives were not cheap but the best I've had this season – the cold weather seems to improve the taste. Although not possessing the length of some Whitstable natives I had last year I'm sure they will improve. I did get one bad one which luckily I could smell before having a chance to scarf it down. It's only about the sixth duff one I've ever had so I'm not doing too badly. It was immediately replaced for two fresh ones without question. 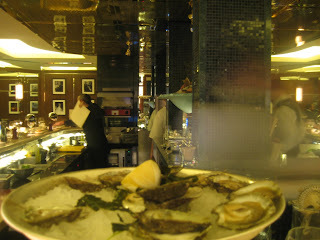 Although I liked my Oysters the experience wasn't as enjoyable as my current favourite bar, Bentley's. 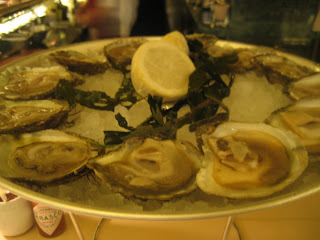 There you get some decent bread to nibble on while you wait and because the bar is smaller you can have more banter with the guy (shuckers always seem to be male) opening your bivalves. Still I'm sure it's going to be a big success especially as scoring a res for the restaurant is proving increasingly problematical. Rammed when I arrived everyone seemed to leave en masse, on the dot, at a quarter past seven. 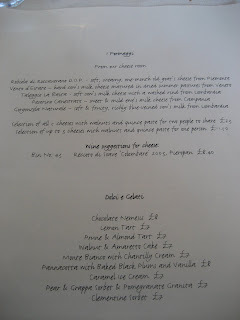 I did fear my personal grooming regime was lacking of late, but all was made clear when I looked at the back of the menu. Altogether now: Mama Mia, here I go again, My my, how can I resist you...(repeat until you lose the will to live). It's a wonderfully restorative drink, your cup of tea, which made my e-mail invitation to join Henrietta Lovell, owner of The Rare Tea Company on Friday all the more welcome. I had spent the previous night (and a good chunk of the morning) drinking my own body weight in well made cocktails at Hawksmoor and Lounge Bohemia (where we saw Miranda Sawyer getting asked to leave for putting her size 10’s on the lovely furniture. Quite right too) and was feeling a little the worse for wear. Henrietta started the company in 2004 after a lucrative but unfulfilling career in printing and used her many contacts in Asia to begin importing, as the name of her company suggests, small production teas from unusual farms in China, India and Africa. After a relatively slow start, focussing mainly on online sales, her teas are now used in quite a few of London's restaurants, including Chez Bruce and soon are to be carried by Waitrose. All of this is worthy enough, but there are lots of companies importing lots of interesting teas into the U.K these days. It’s Henrietta's extraordinary enthusiasm, bordering on the obsessive as well as the quality of her teas, which marks her out for special comment. The invitation came after she saw my post about making chocolate with Paul. A Young, who also uses her tea and I turned up at her smart North London flat, from where she still runs her business, looking forward to something warming to settle my stomach and take away the chill from the rain sodden morning. She did not let me or my companion down and we were soon working our way through her range from white silver tips from Malawi to hand made black leaf tea from Meghalaya, India finishing with Bai Mudan a whole leaf China tea to cleanse the palate. For Henrietta though tea is not just for drinking and, after we had finished the tasting, we spent a good hour talking about other food uses for tea including the smoking meat or fish and making of green tea ice cream. Particularly, however, being a woman after my own heart, she enthused how her teas could be used in cocktails and yesterday afternoon, she e-mailed me the splendid recipe for an Oolong Mojito below. shake with ice. 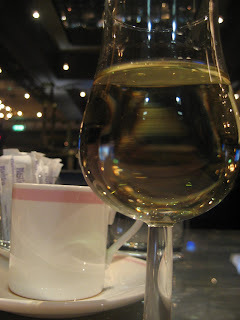 Strain into a cocktails glass. At this time of the year I like indulging in a little something. I know it’s bad. I know it’s wrong. But I do it anyway. I just can’t help myself. I do feel a smidgeon of shame afterwards but that’s soon wiped out by the waves of pleasure coursing through my body. Yes, the Pret Christmas Lunch Sandwich really is that good. I eat one every day and still have the figure of an athlete. Albeit one who has been retired for many years and owns a pub. It’s not so perfect, however, that I can’t pimp it up a bit from time to time. Preferably with a few slices of Kelly Bronze Turkey. Go hard brother number one indeed. 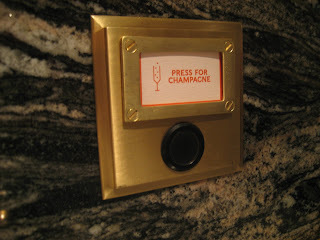 Talking of pimping things up, I went to Bob Bob Ricard the other day. It’s a new all-day brassiere that’s just opened in London’s fashionable Soho on the site of the late, unlamented Circus and the inside looks like Mr Westwood (Big Dog) has got his hands on it, although I’m told it was actually the ubiquitous David Collins. I’m sure there are people who will like the restaurant-as-orient-express-waiting-room look but after a hard day at work I prefer something less visually challenging. Something say, that concentrates on providing, er, oral satisfaction. The staff have been pimped up as well. 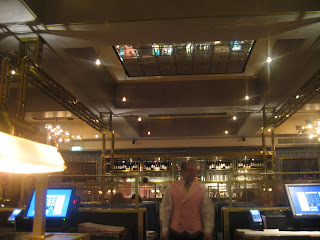 Oh, how the owners must have chortled as they picked out the salmon-pink waistcoats for the waiters and chequered jackets that only French stageurs thought cool and smart. And that was in the Eighties. The bread offered to me tasted like it might also have hailed from that era, being as tough as Arthur Scargill. At this point, as you may imagine, I was mentally sharpening my quill pen, ready to write some barbed and witty comments on the horrors that were to follow. But apart from some terrible coffee right at the end it never happened. 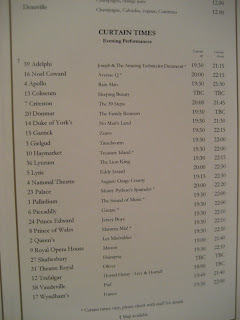 It was one of those happy occasions where things were much better than my expectations. My choices were more or less forced as offering an all-day eating experience seems to equate to a severely abbreviated list of dinner options. I didn’t fancy fish, I didn’t want comfort food (I’d had my PCLS) and I didn’t want a £32 Grouse. So Steak it was. 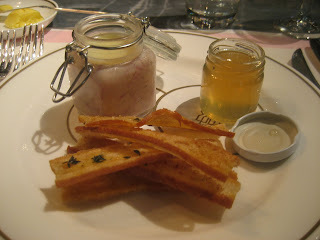 But before that a rather fine dish of Potted Pork (Middle White). Served with a nice perky jelly made from Perry, the pork had been confited nice and slow, carefully shredded and mixed in with some julienne of bacon. 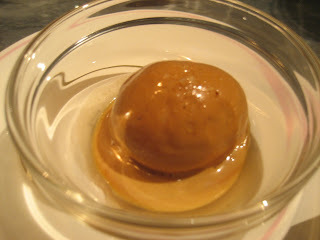 Served at room temperature it spread easily onto freshly made melba toasts and delivered a good fatty/porky hit. One of the waiters noticed me getting down and dirty with the pig and brought over a finger bowl. A nice touch. In fact the service throughout the evening was excellent: friendly, attentive and efficient, not surprising given many of the waiters and managers had previously worked in top places like J Sheekey, The Ivy and Galvin Bistrot. Which makes the outfitting of these professionals – for that is what they are – all the more crass. Back to the food. That steak was pretty good. 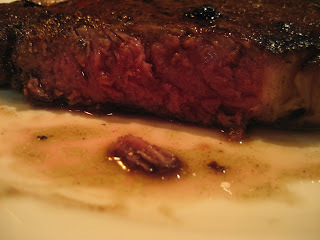 Ok, it wasn’t the absolute best tasting beef I’d ever had but then rare is the steak that gives me an O-face these days. It was cooked perfectly and rested to give a even bloodiness. 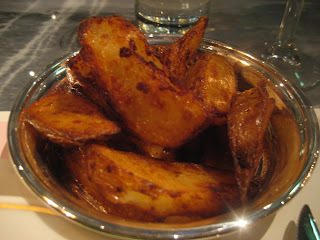 The chips that came with it were actually wedges but had been properly blanched then deep fried to give a light interior and crisp exterior. 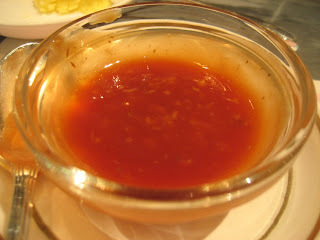 There was also a tasty little riff on tomato ketchup that had horseradish and anchovy essence in the mix. 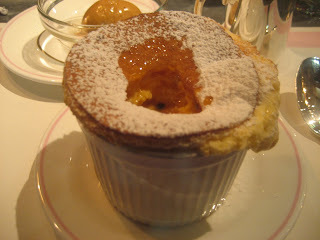 A Passion Fruit Soufflé to finish wasn’t as ethereally light as Corrigan’s version, being just a bit too eggy, but was fine just the same A scoop of Salted Caramel Ice Cream was everything it should have been. 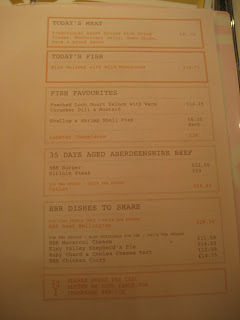 Apart from the minor irritation of a room I didn’t like and not forgetting the stupidly small thimble-like wine glasses, BBR pretty much did the business for me on the food front. My only concern is how long an (obviously) good chef is going to be happy knocking out what are essentially short order plates with a few poshed up comfort food dishes. My concerns were further raised when I overheard talk of “opening another branch”, “it’s not just about the food” and “we’re opening a bar downstairs”. Phrases that never were nor ever will be synonymous with good restaurants. 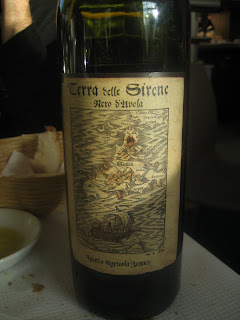 La Trouvaille plays an important part in DH eating history. We “discovered” the place after a party way back in 2001, HP having read about it during his ongoing and thorough research into new openings in London. 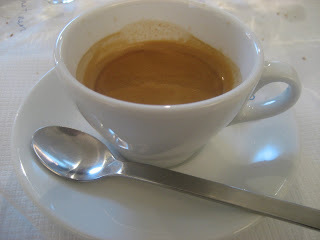 We expected little, the service was shambolic and the room messy, but our meal turned out to be one of those all too rare occasions when the first bite of food tells you that you are on to something. It was a great meal, lavender scented lamb, petite salle with crisp, crackling skin and reasonably priced wines from an eccentric wine list chosen by the equally eccentric owners, who could regularly be seen shooting off on the back of a scooter in search of missing ingredients. The ingredients themselves were top notch too, it was the first place I encountered Poilane bread in a restaurant and everything else was sourced from Borough Market before if became Disneyland. We loved it and returned often. We brought people from the food boards here and our posts on Chowhound even prompted Jay Rayner to review it for The Observer. These things never last, of course and eventually, when they opened a second, short-lived branch in Islington and ended up with two not very good places rather than one great one, we stopped going. I had not been back in at last five years, but when my publisher, Eleanor asked me to arrange somewhere for lunch where we could talk the location made it pop back into my mind. It’s changed since my last visit. Haven’t we all? There is now a smart dining room upstairs with linen table clothes and dreadful, awkward plastic chairs. 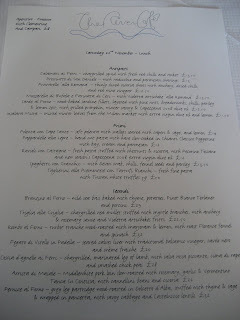 But, the menu still reads well, filled with rustic sounding French dishes and with two courses for £16.50 looked like reasonable value for money, particularly as we were all sticking to mineral water. I didn’t try the black pudding starter chose by my editor, Bernie, but it looked suitably plumped out with blobs of fat and would probably have made a better choice that the Oeuf Meurrette chosen by myself and Eleanor. The eggs were cooked perfectly and dribbled yolk into the red wine sauce. But, the lardons, scattered on top, had not been cooked to a crunch and the eggs themselves were too white to have been poached in the wine. It was a poor assembly kit of a dish that can be one of the greats and don’t get me started on the stupid dishes that caused knife, fork and spoon to slither messily down to the table when we tried to rest them. 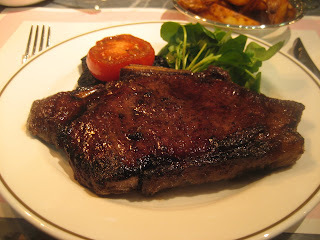 An onglet main course saw a decent hunk of beef presented and cooked perfectly rare as ordered, but the announced frites turned out not to be of the crispy, delicious gallic variety but of the thick, fat and ugly British type and they remained nearly all untouched. 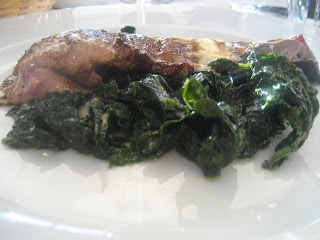 I did not try either of the other dishes, but the dryness of Bernie’s duck appeared to have been hidden under a sauce that had split and Eleanor’s lamb casserole struck me as workaday at best. That’s the problem La Trouvaille was never workaday. 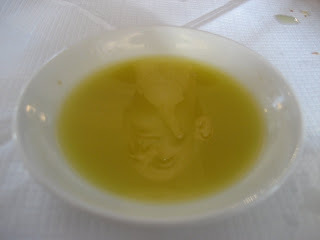 Even when I popped in there for quick lunches, it always delivered in both food and charm, but at this meal, while service remained friendly, the whole thing had lost the quirkiness that made the place, as its name suggests, such a little treasure. It’s now just A.N. Other French bistro and unfortunately not a desperately good one at that. DH will just have to keep digging. There is an ancient Chinese legend, which tells of two weary travellers who, after a long journey, find themselves in the heart of a big city. Famished from their journey, they approach a cheery tavern where they are quickly seated in the warmth and presented with hearty dishes to assuage their hunger as the friendly inn owner and his wife bustle about making sure that they and all the other guests receive perfect hospitality. Their food is spectacular. A soup made with noodles and beef tendon warms them to the soul, small dumplings threaten to burst so filled are they with savoury broth and little nuggets of chicken crackle with the sound of recent frying. It is everything they could have dreamed of. It is the stuff of legend and, sipping on restorative tea they close their eyes to savour the moment. Er, and then they wake up and find that they are in fact two impoverished food writers seated in a draughty corner of yet another restaurant in Chinatown, which promises to deliver something different but fails. The service is perfunctory and the food, cheap though it is, still doesn’t feel like the real thing. Leong’s Legend (you knew there had to be a point to the beginning of our tale, didn’t you?) is one of those places that crop up in Chinatown every now and again and get peoples' undergarments all in a knot. “Squeal, it’s the real thing. Squeal” You know the drill. 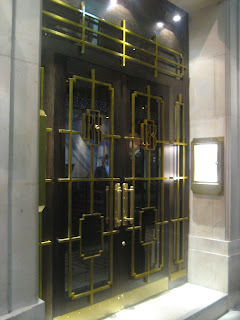 They are of course no such thing and although, like Bar Shu, they have some aspects the purists can cling onto, the economic factors of their location and therefore their clientele ensure that they are never going to take too many risks or be too (dreaded “A” word alert) authentic. LL has been around a while now and had people raving about its interpretation of Taiwanese food and its soup filled dumplings but, even on a brief and cheap lunchtime excursion and even to our palates, untutored to this island’s cooking, the dishes all seemed listless, neutered and lacking in taste. While the beef tendon in a “spicy” soup was pleasingly fatty and soft, the noodles were pre-cooked to mush and the broth lacked any discernable flavour at all. 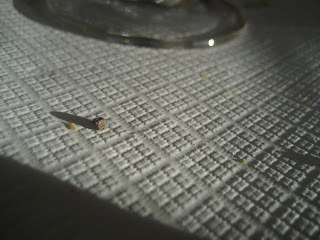 Likewise fried chicken, where the small pieces of bird had toughened up to little rocks as if they had just been refried from the previous night's service. The much vaunted siu long bao, dumplings filled with soup, are originally from Shanghai but taken to excellence by many Taiwanese places, as I found at Din Tai Fun in L.A. The elastic pastry of the best examples bulges ominously as you pick them up but never bursts giving you the pleasure of biting a hole and slurping out the contents. Here, the juice was already leaking over the steamer and the wet dumplings had already attached themselves to the base, which meant that any residual liquid was lost as we struggled to pick them up. The meaty contents were well seasoned and a final dish of braised belly pork with rice, was perfectly fine , but like the rest of meal, all far too polite to cause a raised eyebrow. Our bill of £24 including service charge was low enough not to depress us too much but did add to our conviction that all this talk of a new beginning in Chinatown is, like the beginning of this post, a bit of a myth. 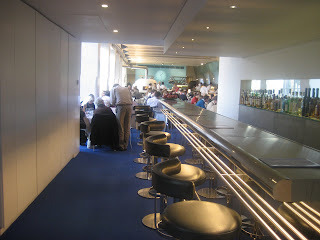 As we trundled along on The Hammersmith & City line towards The River Café, my expectations for our lunch were not as high as I was sure the final bill was going to be. It was years since I had last set foot in the place and my memory of that meal, of its tired cooking and ingredients that failed to support the much declared search for the finest available, still left a bitter taste in my mouth. I had railed against it ever since and only persuaded HP to go on this occasion because we were to write about it for someone else, just as we were for St John a few weeks earlier. Like St. John, The River Café is one of London’s great iconic restaurants and, like St John it too was emerging from a recent refurbishment although for altogether less positive reasons. 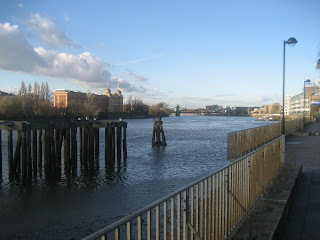 Also, like St John, I was expecting our meal at The River Café to confirm what I already suspected, that this was a restaurant resting on its expensive, carefully sourced laurels while young upstarts elsewhere took what Ruth Rogers and Rose Gray had started to new levels. It was an expectation reinforced when we arrived bang on time for our reservation, don’t you dare be late here, to be shown to a tiny table, close enough to our neighbours that we could share body warmth in a chilly dining room as we were given the menu with its legendarily scaring pricing structure. 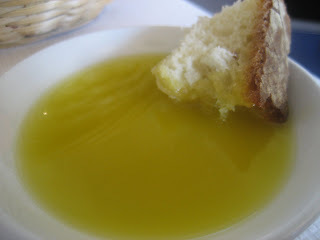 However, once a bowl of bread was placed on our table and we had torn off chunks to dip in a superb olive oil, we took time to actually read the menu. While the prices still lead to a bill higher than the GDP of some emerging nations, they no longer stand alone in that regard in London and, in fact, some of the dishes looked positive value for money, particularly if they turned out to be as good as they sounded. 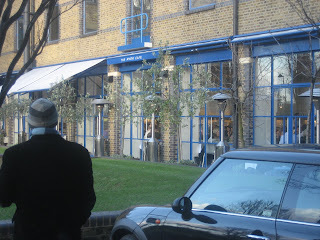 And, there is the rub with The River Café. If your schtick is predicated on phenomenal ingredients not screwed around with, you have nowhere to hide. 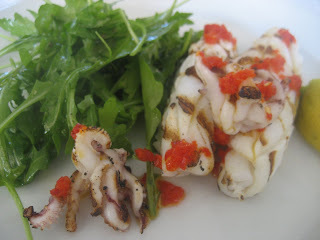 On my last visit slack execution made the whole experience a dispiriting one, but HP’s first bite of his signature starter, char grilled squid with chilli flakes and rocket had him glancing at me with that look which can only mean “we might have some fun here” It was good, better than I recall, with the soft, almost buttery squid taking on the heat of the chilli and the pepper of the rocket to perfect effect. 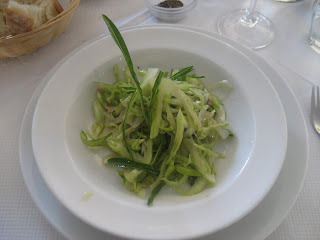 I was less convinced with my Puntarelle “a la Romana” unless that is “a la Romana” means that the small shoots of cicoria should be sloshed too liberally with red wine vinegar. Although I polished it off, at £13 so would you, each bite made my mouth pucker like a reticent sphincter in a gay bathhouse. A shared pasta dish brought my opinions back into line with HP. 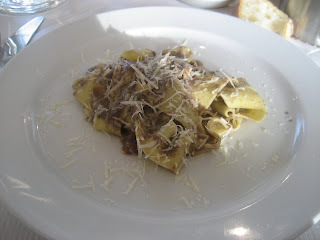 Perfect sheets of pappardelle stood up to a bite, as they should and came with just enough coating of a sauce of hare cooked slowly in Chianti for both to express themselves through a strong seasoning of bay and a covering of parmesan. While the small balls of shot that had seen off our little scampering main ingredient almost cracked a tooth, they did at least give evidence to its wild provenance. 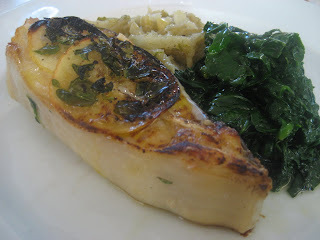 The sight of Ruth Rogers in the kitchen reassured us that someone would be looking at the plates before they came to our table and that same look from HP as he took his first slice from a huge tranche of meaty turbot roasted with marjoram and lemons, confirmed that, even at £32 a pop, this was a megastar dish. Better even than my own choice of Fegato, which came to the table perfectly cooked to medium rare and in a messy, ugly but entirely delicious sauce of balsamic and crème fraiche. Serious dishes from a kitchen at the very top of its game. 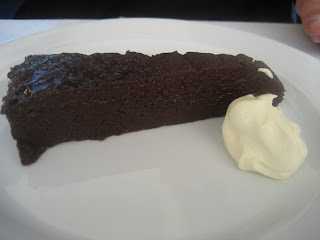 Famously, The River Café cookbook contains a recipe for Chocolate Nemesis, a recipe that few, if any, have been able to replicate. So, while HP persuaded one of our incredibly friendly and efficient servers to bring him scoops of ice cream that went with all the other dishes, I plumped for that. 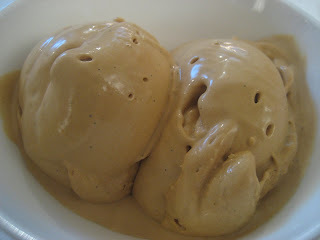 The ice cream was, of course, superb and HP wiped the bowl clean. The nemesis, well, it was a chocolate cake and how good can a chocolate cake get? Actually, in this case, very good indeed, moist and rich. 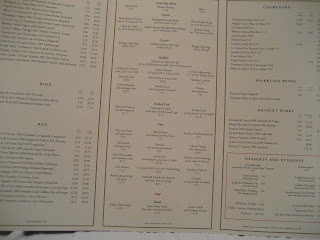 With such focus on its pricing, you would expect the wine list to bring sobs from all but the uber-rich. 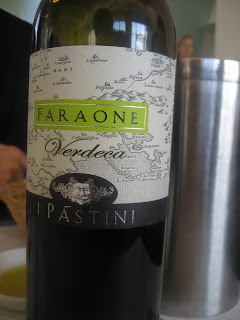 However, it is surprisingly sensible and although they were out of our first two choices, a bottle of Farone and another of Nero D’avola served the meal well and did not bite the wallet too hard. 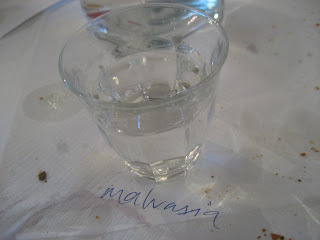 By the time we came to coffee and post dessert grappa, we were glad of the paper tablecloths as our server scribbled the names of our boozy drinks it to help us remember and then slipped us our bill once we had sipped enough clear spirit to numb the oncoming pain. 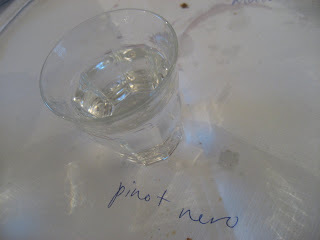 Of course, it’s not cheap and our bill approached £200, but remove the grappa and one bottle of wine and pro rata their VAT and service and our meal here, with its outstanding moments, was not much above our poor meal at St. John. It convinced us that, while the latter was on the wane, the layoff here at The River Cafe has only served to reinvigorate this once weary veteran to a point where we could see it being around for at least another twenty years.